A small land in Neopia, Meridell was discovered in Year 4 on the 30th Day of Swimming. Neopians know this Medieval land as a place of games, vegetables, and knights in shining armor. With Meridell’s special day approaching, I thought it was fitting to spotlight this lovely land and all it has to offer, to give you many ideas on ways to celebrate the holiday. Meridell has different areas to explore, aside from its mainland. A small venture north brings travelers to the Meri Acres Farm, a staple of the nation, and the grand castle to the west is home to several attractions as well. Although small, excitement and adventure is packed into each area, offering lots to do for all Neopians. Even though this land is not known for its commerce, there are still three shops for inhabitants and travelers to enjoy. In the main area, one can visit Ye Olde Petpets to find a special friend for his or her Neopet; these special Medieval petpets are indicative of the land, and include the Whinny, Symol, Mortog, and of course, the Drackonack, which many Neopians seek to obtain the avatar. If you get hungry in your travels, you can also visit Meri Foods, which sells delicious, but unique, food from this land, like the ever popular Raw Potato and Tasty Turnip Tartar. The only other shop in Meridell exists inside the castle: Kayla’s Potion Shop. Here, Neopians can purchase special magical potions, ranging from those that increase your pet’s stats (strength, defense, endurance, and speed), cure diseases your Neopet may contract, or those that can be used in the Battledome against an opponent to inflict damage. It is also a shop that many choose to “restock” from - those potions can be super expensive and valuable! This nation is PACKED with avatar opportunities! As I just mentioned, the Drackonack can be obtained from the Ye Olde Petpets shop in Meridell, and the avatar will be yours once it eats any cheese item in your inventory. Piece of cake (or cheese, right?)! But that is only the beginning - take a seat, I’ll explain them all to you! Shapeshifter: Sinsi runs this game of puzzles in the south side of Meridell, inviting all users to partake in the game. The puzzles become much more difficult as the levels go, but you’ll earn yourself an avatar after completing level 5, which is an exceptionally doable challenge! Practice makes perfect, and Sinsi is a patient Ixi. 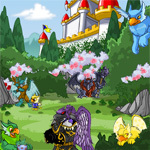 Kiss the Mortog: located on the main page of Meridell, a Mortog boasts his game and entices all to play. The game is simple - pick the correct Mortog to kiss! Picking the right one will turn him into a prince or princess, but pick the wrong one and SPLAT! Exploded Mortog, and you lose all your winnings! Choosing the Mortog that is royalty in disguise propels you to the next round; with each round, your neopoint winnings increase tremendously, but additional Mortog is thrown into the mix, further reducing your odds of picking the correct one. The coveted avatar is yours once you correctly pick 4 Mortogs in a row, earning yourself 5,900np, and then collecting your winnings. Ultimate Bullseye: A hop, skip, and a jump away from Kiss the Mortog lives the happy Turtum, waiting for you to try your hand at a game of archery. This game has always been one of my favorites, and although it takes a lot of practice to get the avatar score of 100+, the adorable avatar makes it worth it. The trick to getting this high score is to utilize powerups gained by scoring a bullseye, and to take advantage of the balloons that appear - hitting a red balloon before hitting the target yields you 30 extra points, and hitting a yellow balloon will yield you an extra 35! Illusen’s Glade: Moving east, you will notice a small house nestled in a tree. This is home to none other than the earth faerie, Illusen. Every twelve hours, you are able to complete one of her quests, in which she asks you to retrieve her an item, much like with a random faerie quest, however, in this case, you are allowed to use the Shop Wizard! The items she asks for do get more expensive as you increase levels, but once you complete level 20 or 21, you are awarded a beautiful avatar! Also, if you complete one of her quests on Illusen Day, March 17, you will be awarded an additional avatar! Cheeseroller: You are able to play this game three times per day. Starting out, you must choose to buy a certain type of cheese to utilize during your run. Personally, I had luck with Tyrannian Dung Cheese, but there are several others to choose from, including Spicy Juppie Cheese (which is the cheapest, at 150np) and Rotten Cheese (which is the most expensive, at 5250np). The goal is to have your cheese arrive safely at the finish line in under 60 seconds, which is not as easy as it sounds! Choose from different options on how to handle your cheese each turn - in my experience, diving either left or right has given me the best results - and hope you finish in time. Finishing in under 60 seconds yields you neopoints, allows you to keep your cheese, and also gives you a shot at the avatar - unfortunately, you not only have to finish within that time frame, but it’s also random! Keep trying every day, and you’ll eventually get it! Turmaculus: Are you getting tired yet? I told you there were a TON of avatars to be found here! This one is a lot more difficult to obtain than the others I’ve described so far. This giant petpet is only able to be woken by your petpet for one random hour each day. Once awoken by your petpet, if you’re lucky to have gotten this far, there are several options of what may occur, ranging from neopoints, to increasing your petpet’s level, or a prize, but the most coveted outcome is that he wakes up and eats your petpet - yes, literally EATS it! - because this results in an avatar (as well as the option to fight the Turmaculus in the Battledome). Pick Your Own: Let’s move to Meri Acres Farm, now, shall we? This farming area of town also provides the opportunity for two more avatars. The first, Pick Your Own, is simple to obtain, and is a fun experience with farming! Navigate through the crops and pick berries, discarding any you don’t want, and as long as you collect 6 berries (no, piles of dung don’t count!) you’ll leave there with an avatar as well. Extreme Potato Counter: Possibly one of the more infuriating games to play, EPC is a whole new spin on the classic “Potato Counter”, which you can still play - you can also find this in Meri Acres Farm. The new and, er, improved (?) version makes the old one look like child’s play, as the wocky sends the potatoes flying at warp speed, throwing in distractions as well. You will need a whopping 200 points to claim this avatar, so get comfortable - you may be here a while! Attack of the Slorgs: Yet another classic game available to Neopians in trusty Meridell. In case you’re in the mood to shoot at different colored Slorgs, which, let’s be honest, is a common feeling, you can find this game right in the heart of Meri Acres Farm - perfect place for these Slorgs, as they destroy the surrounding crops! This is also a popular attraction at the beginning of the month, as it’s a somewhat easy trophy to obtain. For those going for the avatar, a score of 1000 is needed, but you shouldn’t have too much trouble doing that. Double or Nothing: Venturing into the castle will reveal more activities that will earn you avatars. The name of this game is self-explanatory: pick the right coin, and you win double your bet. If you pick the wrong coin - you guessed it - you win nothing. With each time you pick correctly heads or tails, your winnings will be doubled and you have the option of trying again, which would further double your winnings. To obtain this avatar, you must be very lucky, and collect your winnings when you have at least 320np (which is 5 rounds of guessing correctly). Grumpy Old King: Although not exactly a game, this grumpy king sits on his throne, waiting for Neopians to make him laugh. As Neopians, we know that not only will we get an avatar for making him burst into laughter (with a certain joke, of course), but we will also be awarded an avatar for being kicked out of the kingdom for a joke that is just terribly awful. This can be attempted twice per day! Escape from Meridell Castle: Last, but not least, is my personal favorite attraction of Meridell. This game rounds out the incredible 13 avatars that can be obtained from this land, and can either be your best friend or your worst nightmare. Having played as this Draik for several years, I have grown to love the game and play for fun, even though I’ve already obtained the avatar. The method for collecting this one is a bit different - instead of needed a specific score, you need to be in the top 50 scores at the time that trophies are awarded. Because of this, it is a game that many attempt on the first of the month, when scores have reset and it’s often easier to reach the top 50. Practice definitely makes perfect with this game, but it’s also a bit of luck - did you know you can get 100 points randomly from those number blocks you fly up into?! By now, I bet you’ve realized just how much Meridell has to offer. It is a land full of opportunity and excitement, and the possibilities don’t seem to end! If all that wasn’t enough for you, you can go to Guess the Weight to guess how much the marrow weighs (a chance to earn neopoints, of course!) or play Potato Counter, the more tame version of the one I mentioned before. If you’re looking to make one player’s trash another player’s treasure, visit the Rubbish Dump to pick up items that other’s have gotten rid of, totally free of charge. And finally, if you’re in the mood to test your luck, you can pull up a seat at Round Table Poker or head on over to Turdle Racing to place your bets. With so many ways to celebrate Meridell’s special day, how will you choose to make it memorable? I am very excited to talk about how the Cup and its prizes have evolved over the years and what better place to start than Altador Cup I! Something is wrong with the Emperor of Shenkuu. You begin your mystery at the royal palace where you meet Princess Lunara and Kentari the Neopian samurai.